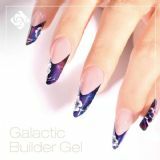 Crystal Nails builder gels: Top quality UV/LED builder gels, that give extremely good structure and durability. Proper materials to create the perfect gel nail extensions and enhancements of the nail bed. We can highly recommend them for both beginner and expert nail technicians. 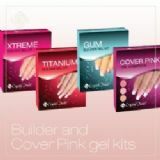 Create the base with the strongest clear gel: Xtreme Clear or Titanium, the nail bed extension with the super thick Rocky Cover Hard Gel or its softer version: Rocky Cover Light, then create the enhacement with Builder Pink I and finish it with an blindingly white: Xtreme White gel!